Here’s a cool idea, and a sweet way to get some great iPad and iPhone apps at a big discount: it’s the first iOS apps bundle from the lovely folks at StackSocial. On offer are 12 leading iPad and iOS apps at up to 83% off their standard prices. There are some top names in this bundle, including the superb Parallels Access app down from $49.99 to $14.99, TextExpander touch down from $4.99 to $1.99, Scanner Pro down from $6.99 to $2.99, and nine more similar big bargains. 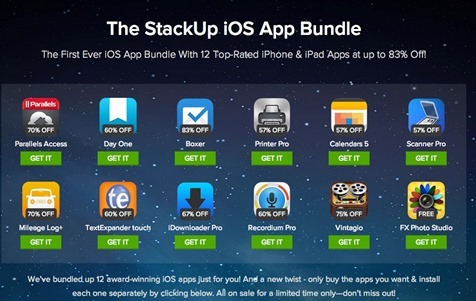 The sale is just for a limited time, so you may want to hurry and check out the deals at the StackUp iOS Bundle page. These discounts are available only via this StackSocial page – not directly in the App Store.